Zach Parise and Ryan Suter, the two gems of this year's free-agent market, remain available with the signing period now in its second day. Each player fielded offers from several teams after the market opened at noon ET on July 1. Neither player, though, is in a rush to make a decision despite the lucrative, long-term nature of the deals. Parise has been huddling with his agent, Wade Arnott, in Mississauga, Ont., while Suter is staying in touch with his agent, Minnesota-based Neil Sheehy, from his farm in Wisconsin. Both could make their final decisions Monday. Parise met with reporters early Monday evening and said he would not be rushing into any decision. "It's such a long-term, important decision, you have to make sure you look at everything," he said. He later told NHL.com, "I have learned a lot about how this process works. My agents have done a great job of showing me all of the information." Parise said the New Jersey Devils remain in the mix for his services, but refused to divulge the other teams on his list. It is believed Pittsburgh, Minnesota, Detroit, Philadelphia and Chicago are on that list, but nothing has been confirmed by Parise or his agent. "We have thoroughly deliberated every option with Zach," Wade Arnott, Parise's agent, wrote in an e-mail to the Minneapolis Star-Tribune. "He wishes to take some time to step back and review all with his fiance and his family. We could be drawing closer to a decision." Sheehy said Monday evening his client would be in no rush to make any decisions. "There will be no decision [Monday] and there is no timetable for his contract signing at this time," Sheehy told reporters. "Ryan is considering his opportunities and is taking the necessary time to give each proper consideration." One free agent that did get signed Tuesday was restricted free agent goaltender Carey Price, who agreed to a six-year deal for a reported $39 million to stay with the Montreal Canadiens. "I'm very happy," Canadiens GM Marc Bergevin said, just minutes after finalizing the details of the contract. "I think Carey brings what we need moving forward. He's a top, young goalie in the League. Having him in net for the next six years gives us a chance to be competitive." The trade market for Columbus captain Rick Nash and Anaheim forward Bobby Ryan may be in a holding pattern until Parise makes his decision. The teams that strike out on Parise could then try to swing a deal for Nash or Ryan. Hurricanes GM Jim Rutherford, in fact, said that would be the case for the Hurricanes as they move on from Parise. One trade that did get made Tuesday saw the Buffalo Sabres send center Derek Roy to the Dallas Stars in exchange for left wing Steve Ott and defenseman Adam Pardy. Parise met with Devils general manager Lou Lamoriello in Toronto on Saturday night. Predators general manager David Poile told reporters in Nashville that he plans to put in a "firm" offer for Suter soon. "Ryan controls all the cards right now and if he comes back and signs with us, that's terrific and we live happily ever after, but we need to move this forward because there are a couple of other directions that we may want to go if we knew he wasn't coming back," Poile said. "So, I'm going to try to speed up the process. It may not do any good because he can do whatever he wants to do." The Devils did take care of their other piece of major business by re-signing goaltender Martin Brodeur to a two-year, $9 million contract Monday. Brodeur, who has spent his entire 20-year career with the Devils, hired agent Pat Brisson and fielded offers through the first day of free agency. Chicago and Toronto reportedly were in touch with Brodeur, whose heart never strayed from New Jersey. 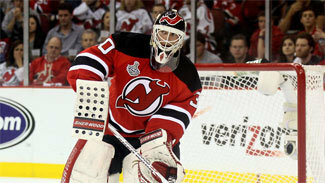 "It was great the Devils stepped up,'' Brodeur told ESPN.com. "You have to understand what's happening obviously with the ownership situation and with what's happening with Zach (Parise). I understood that. I'm just happy this got done." Even without Parise and Suter landing somewhere, the free-agent signing period has still had its share of excitement and activity. 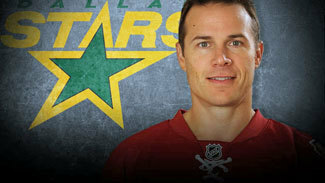 Veteran forward Ray Whitney, who led the Phoenix Coyotes with 77 points last season, said Dallas was the only team brave enough to give him a multiyear contract, so he signed a two-year deal worth $9 million to join the Stars. Whitney, 40, doesn't think his age should factor into how he can play. Vancouver lost defensemen Sami Salo to Tampa Bay and Aaron Rome to Dallas, but the Canucks were able to replenish their blue line with B.C.-native Jason Garrison, who had 16 goals and 17 assists with Florida last season. Garrison signed a six-year, $27.6 million contract with the Canucks. "From traveling from the furthest point you can in the League, to not traveling at all," Garrison told NHL.com correspondent Kevin Woodley. "I'm very excited to stay home and play in front of my friends and family in my hometown. Growing up, every kid dreamed of playing for the Canucks, and I was like everybody else." The Colorado Avalanche locked up forward PA Parenteau with a four-year deal. Parenteau totaled 120 points during the past two seasons with the New York Islanders, including 67 points in 2011-12. While waiting for Parise and Suter to decide, Detroit stayed busy by signing goalie Jonas Gustavsson to a two-year, $3 million contract to be Jimmy Howard's backup. Gustavsson, a prized free agent out of Sweden when he first came to the NHL, had spent the past three seasons with Toronto. The Red Wings also added three forwards, signing Mikael Samuelsson, former Nashville forward Jordin Tootoo to a three-year deal, and Swiss star Damien Brunner, 26, to an entry-level contract. Phoenix attempted to recoup some of the offense it lost in Whitney's departure by signing David Moss, who had nine points in 32 games last season with Calgary. He missed a lot of time with injuries, but Moss, 30, did have 20 goals and 39 points in the 2008-09 season. Rutherford was one of the more active GMs in the first 90 minutes of free agency as he re-signed Jordan Staal to a 10-year extension worth $60 million while also bringing defenseman Joe Corvo back to Carolina on a one-year, $2 million contract with a no-movement clause. Rutherford also signed backup goalie Justin Peters to a two-year deal and forward Brett Sutter to a one-year contract. The Panthers signed Filip Kuba to a two-year, $8 million contract. Kuba, 35, spent last season playing alongside Norris Trophy winner Erik Karlsson. He had 32 points and was a plus-26. The Panthers also re-signed goalie Scott Clemmensen for two years and added pugilistic fourth-line forward George Parros on a two-year contract. There were more than just free-agent signings Sunday, as Ottawa and Columbus made a trade -- the Senators shipped forward Nick Foligno to the Blue Jackets in exchange for defenseman Marc Methot. Methot becomes the replacement for Kuba, while Foligno should give the Blue Jackets at least some of the offense they will lose if they trade Nash. Foligno is a restricted free agent who had 15 goals and 32 assists with the Senators in 2011-12. The Blue Jackets replaced Methot by signing defenseman Adrian Aucoin to a one-year, $2 million contract, while the Senators replaced Foligno by signing Guillaume Latendresse to a one-year contract worth $1.2 million. Latendresse is coming off of two injury-plagued seasons with Minnesota. Dustin Penner cashed in on his strong Stanley Cup Playoffs run with the Kings by re-signing with L.A. for one year at $3.25 million.